With Valentine’s day right around the corner (guys are you listening? ), I’m inspired by everything red and frilly, and rubies are definitely on that list. Rubies are one of the most beloved gemstones in the world and are often referred to as one of “the big three” precious gemstones, which are rubies, emeralds and sapphires. Who wouldn’t love a big honking ruby for Valentine’s day, (or any day for that matter!)? Some of the most beautiful rubies in the world have historically come from Burma, now called Myanmar. The most highly prized color of Burmese rubies is referred to as “Pigeon’s Blood”. 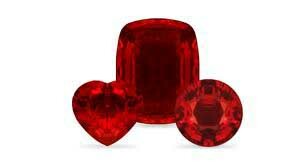 Unfortunately, most of us can’t afford one of these jewels, so there are alternative red gems to set your heart a-flutter! 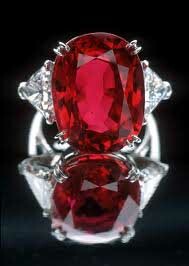 Throughout history, may famous red stones that we’re once thought to be rubies, we’re later proven to be spinel. Probably, the most famous example is the Black Prince’s Ruby, set in the British Royal Crown Jewels. Actually, at one point in time all red gemstones we’re thought to be rubies, until advances we’re made in gemological testing. Wow! I just said gemological testing, I’m really nerding out today!! Fine, I’m actually a closet geek, guess the secret’s out! Then, there are also things like, dyed and color coated quartz and topaz, which are super cheap and can come in any color of the rainbow. So happy shopping, whatever the budget may be! www.fromtheashesvintagejewels.com and what the hell, just buy something while you’re there! proudly made in Brooklyn NY!! !